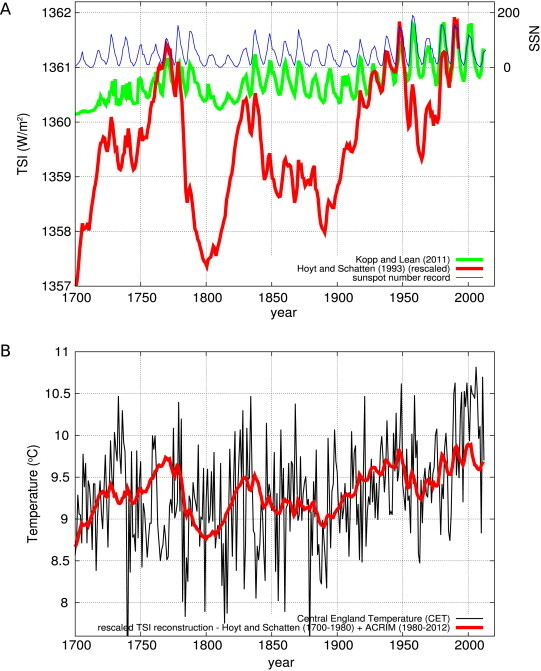 "can be recognized only using specific techniques of analysis that take into account non-linearity and filtering of the multiple climate change contributions" and "Multiple evidences suggest that global temperatures and sunspot numbers are quite related to each other at multiple time scales. Thus, they are characterized by cyclical fractional models. However, solar and climatic indexes are related to each other through complex and non-linear processes." A simple linear model based upon the "sunspot integral" and ocean oscillations explains 95% of climate change over the past 400 years. 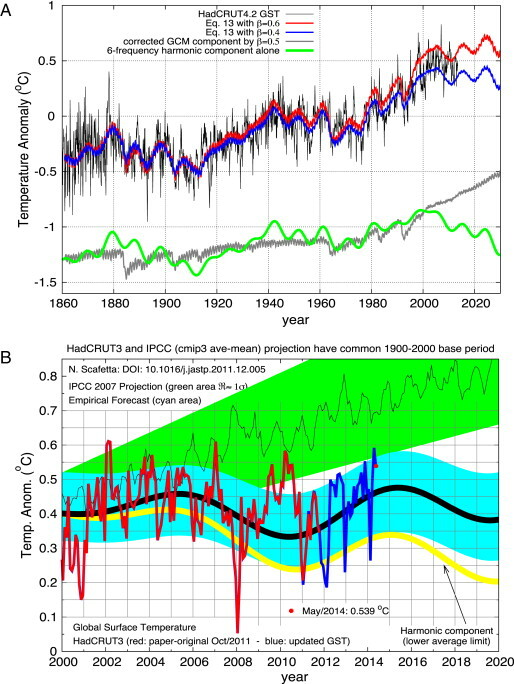 Dr. Scafetta's model [black line] based upon solar and anthropogenic forcing is performing much better than the IPCC models [green band] which dismiss the role of the Sun in climate change. Global temperatures and sunspot numbers. Are they related? Gil-Alana et al. claimed that the sunspots and Earth’s temperature are unrelated. I show that Gil-Alana et al.’s claims are based on a number of misunderstandings. 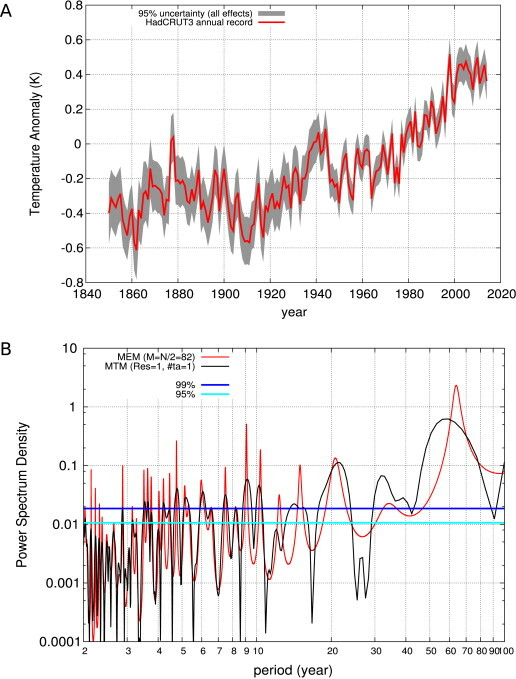 The global surface temperature does nor present any “zero” frequency “pole” or “singularity”. The temperature signature is made of oscillations plus an anthropogenic component. Appropriate solar proxy models demonstrate the existence of a significant sun-climate relation. Recently Gil-Alana et al. 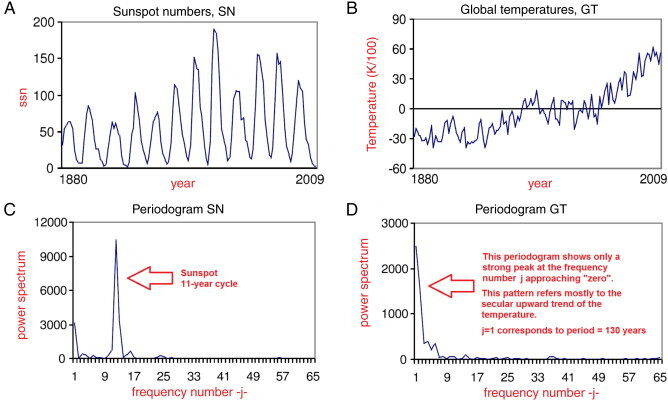 (2014) compared the sunspot number record and the temperature record and found that they differ: the sunspot number record is characterized by a dominant 11-year cycle while the temperature record appears to be characterized by a “singularity ” or “pole ” in the spectral density function at the “zero ” frequency. 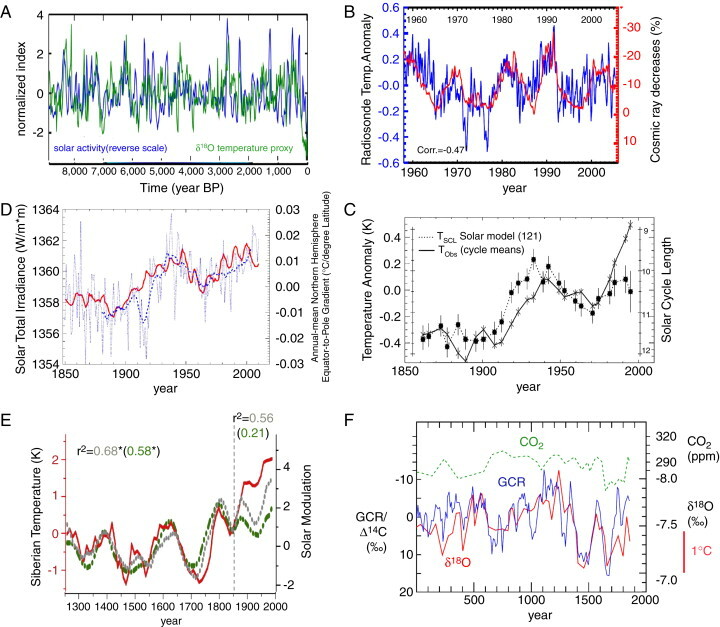 Consequently, they claimed that the two records are characterized by substantially different statistical fractional models and rejected the hypothesis that the Sun influences significantly global temperatures. I will show that: (1) the “singularity” or “pole” in the spectral density function of the global surface temperature at the “zero” frequency does not exist—the observed pattern derives from the post 1880 warming trend of the temperature signal and is a typical misinterpretation that discrete power spectra of non-stationary signals can suggest; (2) appropriate continuous periodograms clarify the issue and also show a signature of the 11-year solar cycle (amplitude ), which since 1850 has an average period of about 10.4 year, and of many other natural oscillations; (3) the solar signature in the surface temperature record can be recognized only using specific techniques of analysis that take into account non-linearity and filtering of the multiple climate change contributions; (4) the post 1880-year temperature warming trend cannot be compared or studied against the sunspot record and its 11-year cycle, but requires solar proxy models showing short and long scale oscillations plus the contribution of anthropogenic forcings, as done in the literature. 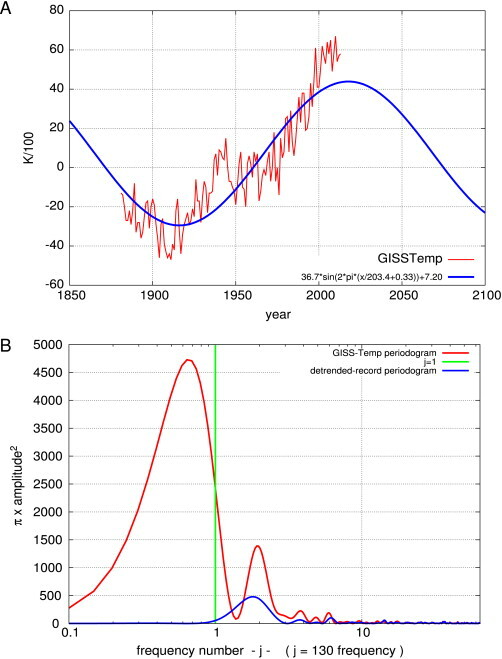 Multiple evidences suggest that global temperatures and sunspot numbers are quite related to each other at multiple time scales. Thus, they are characterized by cyclical fractional models. However, solar and climatic indexes are related to each other through complex and non-linear processes. Finally, I show that the prediction of a semi-empirical model for the global surface temperature based on astronomical oscillations and anthropogenic forcing proposed by Scafetta since 2009 has, up to date, been successful.